There’s been rainbows and piano keys and even tessellation artwork used to designate crosswalks throughout Long Beach. Well, the peeps over at Studio One Eleven have eschewed all of the above, opting for a cleaner, if not more outright wittier interpretation: a bar code that uses the DTLB zip code as its number source. Sitting at the intersection of 3rd and Promendade at the southern foot of The Streets DTLB—the massive development formerly known as City Place and undergoing one of the largest revamps in the city—the crosswalk is charming, smart, and unlike many of its counterparts, refreshingly design-centric. 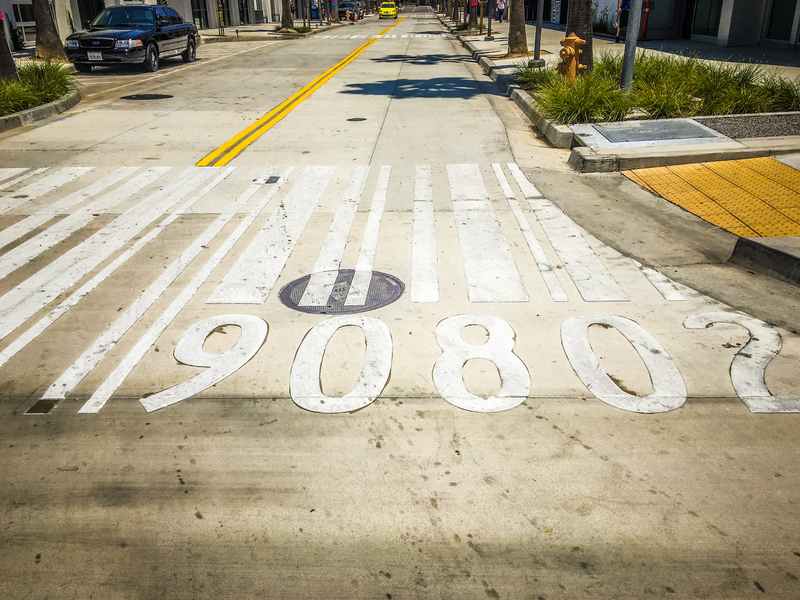 “The crosswalk represents a playful retail bar code with the numbers being 90802-Downtown’s zip code—as an ode to both the retail roots of The Streets and our new home,” said Michael Bohn, principal at Studio One Eleven. While crosswalks are typically marked with zebra markings—simple white and black lines—creative crosswalks serve two larger purposes. The most obvious is the artistic flair they add to the environment; simply put, they’re fun. But more importantly, they increase pedestrian safety and awareness. Pedestrians are more likely to use the crosswalks rather jaywalk and cars are more likely to slow down when approaching colorful, creative designs on the road than the typical, monochromatic crossings they are used to seeing daily.